On Saturday I took advantage of the good hiking weather and ascended Loudoun Heights overlooking Harpers Ferry. 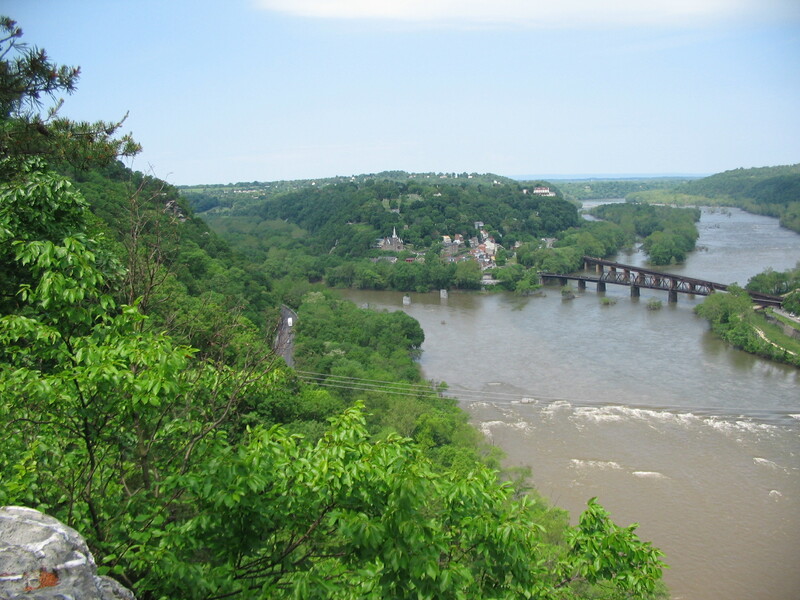 The main attraction to the heights for the Civil War enthusiast are several extant fortifications, in addition to a view of Harpers Ferry and surrounding ground. The park service lists the trail as 8 miles, but that probably includes distance from the Visitors Center area. I found the distance from the parking area near the Highway 340 bridge up to the northern overlook to be closer to six miles. The trail is rated “strenuous.” From the crossing of the Shenandoah River to the crest, just over three-quarters of a mile, the elevation increases from around 275 feet to 1150 feet above sea level. My advice is to pack well, and pick a cool day. Where the Appalachian Trail turns south, two different legs branch off to the north and the heights proper. The Orange Blazed trail follows one of the Charcoal roads across the lower tier of the heights. The Blue Blazed trail branches off the Appalachian Trail further up the heights, and follows the ridge crest more closely. I recommend the blue trail going up for two reasons. First the fortifications are along the blue trail. Second, well it is better to get the climbing out of the way while your are able to! Regardless, both Blue and Orange merge about a half mile to the north. Before turning onto the Blue trail, I walked the Appalachian for about 300 yards further south to locate what might be the remains of a blockhouse dating back to Jackson’s first occupation of the Heights in 1861. I returned back to the Blue Trail and proceeded north. During the Siege of Harpers Ferry, Brig. Gen. John G. Walker sent the 27th North Carolina and 13th Virginia to secure the heights on September 13, 1862. Finding the ground unoccupied, Walker then ordered three Parrotts from French’s Battery and two “rifled pieces” from Branch’s Battery to the heights. My records show Branch’s contained one Parrott and two 3-in Ordnance Rifles at this time, but presumably Walker meant the Ordnance types. Walker’s report mentions reducing a Federal battery and causing much “great consternation and commotion” while firing down on Harpers Ferry. 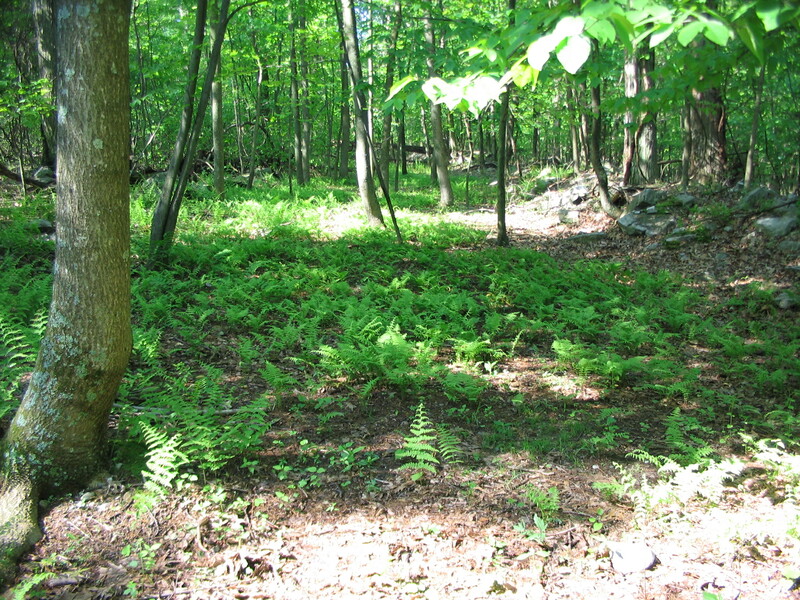 My estimates are the guns took positions somewhere along the Blue Trail a few hundred yard north of the Appalachian Trail. A short distance up the trail several rock pilings are on either side. 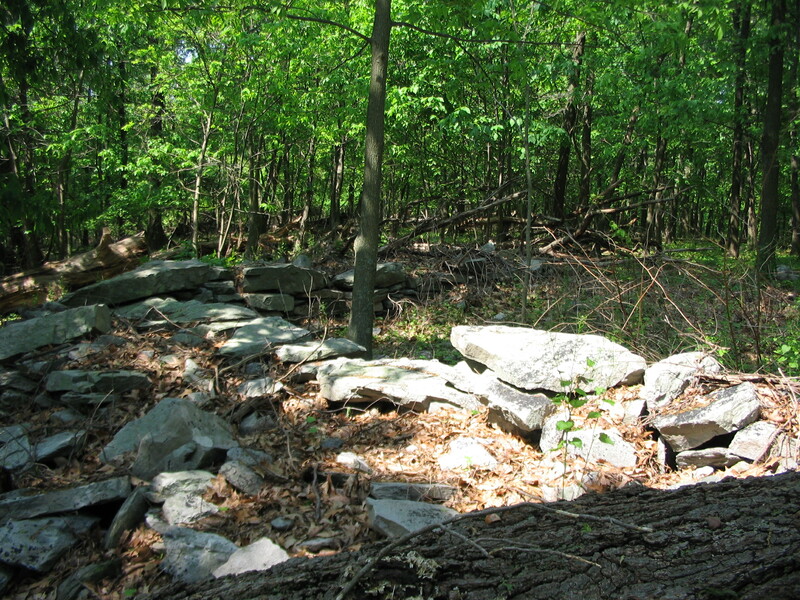 These are partly debris kicked up by the logging of the heights, but some are the residue of Federal occupation in October 1862. The 2nd Division, XII Corps held this position during the slow pursuit after Antietam. 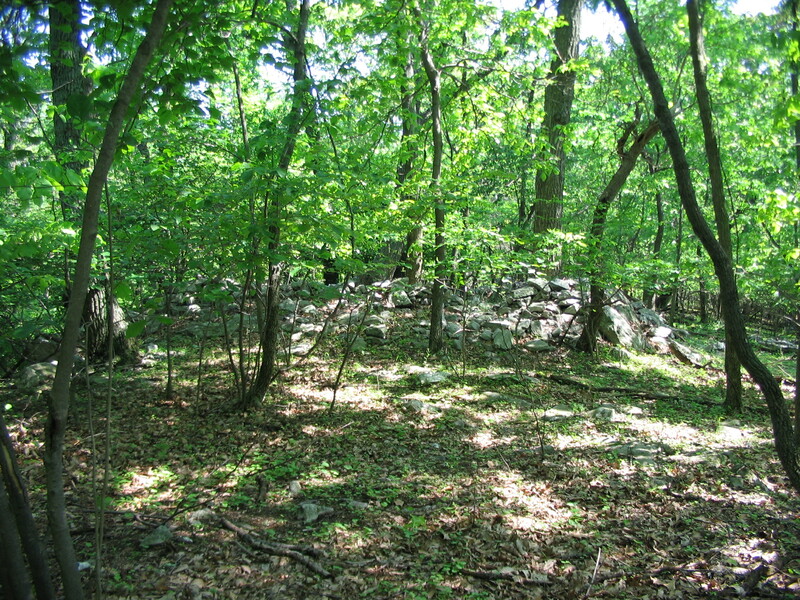 General Greene’s Federals improved the existing blockhouses and added several stone redoubts and rifle pits. Moving further north along the trail, two “vistas” are presented by way of power line cuts through the wooded slopes and a third “overlook” from the cliffs. 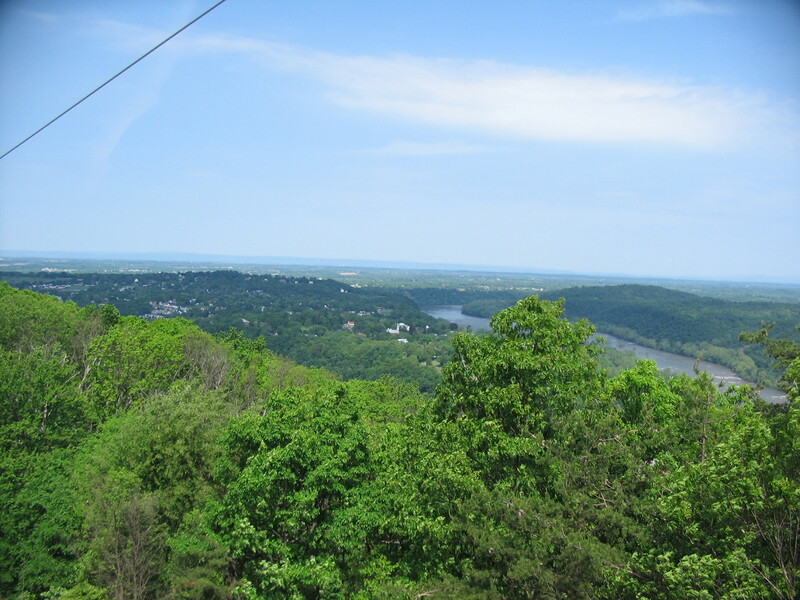 The first “vista” offers a sweeping view the terrain to the west, including the upper portions of Harpers Ferry, Bolivar Heights, School House Ridge, and the approaches from the west. 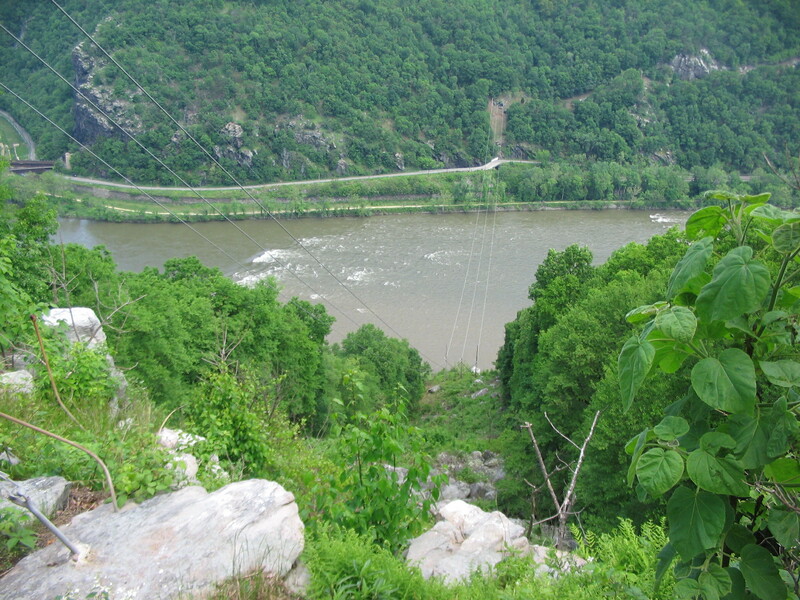 At the second of the vistas, a better perspective of the dominating elevations of Maryland Heights is apparent. Also of note is the view of South Mountain, in the distance here. 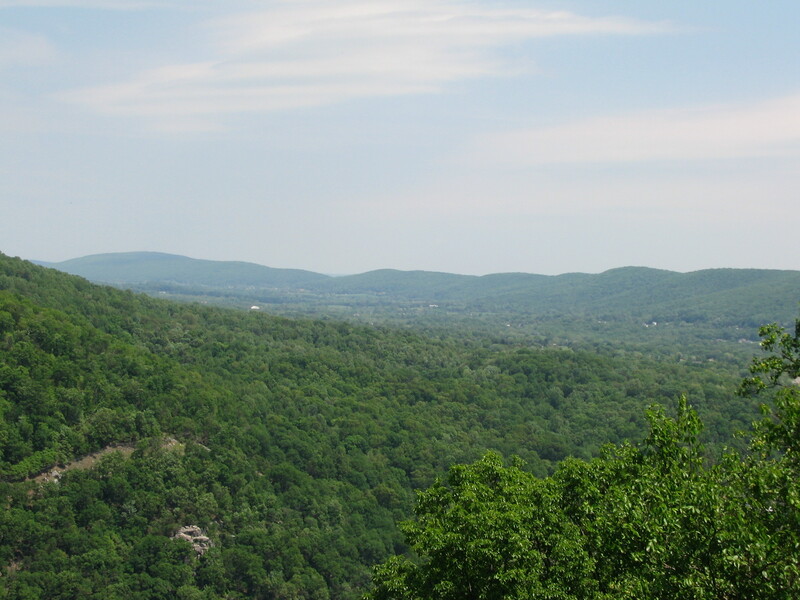 I include this mostly because the most distant, and highest, elevation of South Mountain in this view (distant left) is the high ground just south of Fox’s Gap. Both Crampton’s and Brownsville Gaps are in the distant center. Moving on, the last overlook is actually the northern most point in the Blue Ridge at the Potomac. 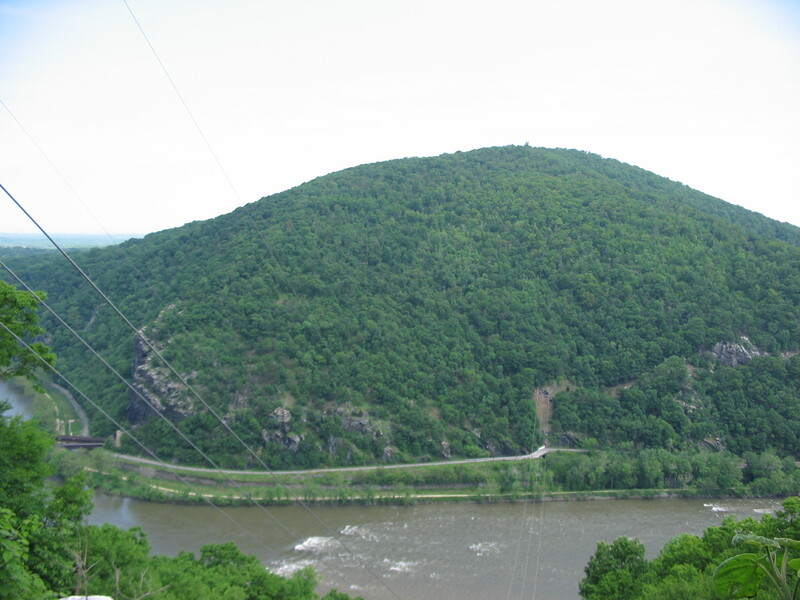 The average visitor to Harpers Ferry notes this as a set of cliffs over Highway 340 (seen in the center next to the river). From this overlook, the trail heads down the slope to Highway 340. I opted to back track across the heights and down the Orange Trail. I’d rather walk up and down the rocky slopes than to dodge traffic. Overall the hike took four hours to complete, with all the back tracking and a lunch at the last overlook. Loudoun Heights certainly qualifies as “off the beaten path.” I wouldn’t recommend it if you have a single day to see Harpers Ferry. But it makes for a great day trip excursion. I found David T. Gilbert’s A Walker’s Guide to Harpers Ferry quite useful for this hike. 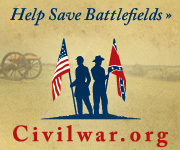 However for a map, I used Trailhead Graphics’ Civil War Campaigns Across the Potomac.